On Saturday, April 14th the Kibbe Museum in Carthage commemorated the 147th Anniversary of the Assassination of President Abraham Lincoln. 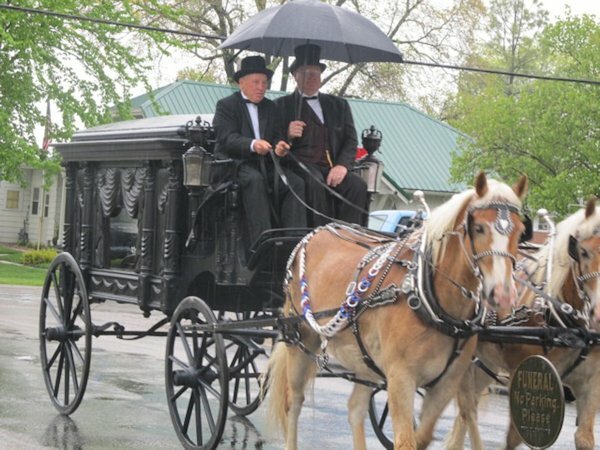 The afternoon began with a horse-drawn hearse bringing in the replica of the President's casket. The casket was then carried in to the "East Room of the White House" by Civil War re-enactors. Ada Hubbard, and Jayne Ekhardt were present. The tour starts in a log cabin replica and goes through some historical items of the 1800's. There are several items in the museum connecting Lincoln and Hancock County. A fireplace mantle from a home in Carthage where Lincoln was known to stay with friends, and an 18 Star hand sewn flag that was especially sewn for Lincoln's October 22, 1858 speech in Carthage is also on hand. Model replicas of Lincolns' tomb in Springfield, his funeral train and his Memorial arch are on display as well. The train carrying Lincolns' body traveled to 180 cities and to seven states along it's 1,654 mile journey. The Kibbe Museum acquired the items from the Museum of Funeral Customs in Springfield which closed in 2009. The replica of Lincoln's casket is on permanent display at a new exhibit entitled "Lincoln: The Making of a Man". Spring hours for the museum are 1 to 4 p.m. Monday, Wednesday and Friday and the last two Sundays of each month from 1 to 4 p.m. or by appointment. Starting after Memorial Day, the museum is open 10 a.m. to 4 p.m. Monday through Friday and from noon to 4 p.m. on Saturdays and Sundays. Saturday afternoon's re-enactment of the 16th President's death began with a horse-drawn hearse bringing into Carthage the replica of President Abraham Lincoln's casket.